Are you ready to let your hair down, metaphorically speaking and relax for the summer? Me too! James is officially done with the 8th grade and we are free, sort of. Since it looks like we will be continuing to home school through the high school years (*gulp*), I've been researching curriculum and figuring out the plan for the next 4 years. But first, it's break time and what better way to spend it than diving into some science fiction, a bit of fantasy, wondering back in history with a futuristic bent, and delving into the philosophical ideals of steampunk. And since the majority of stories seem to take place in Europe, we'll continue our armchair travelcation in England for one more month before moving on to..... I haven't yet decided. Maybe the middle east??? H.G. 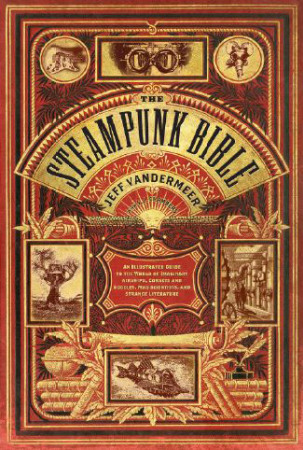 Wells and Jules Verne were considered the forefathers of steampunk and writers created worlds in the 19th century Victorian era which were driven technologically by steam rather than electricity. The term steampunk was a variation of cyberpunk and coined by K.W. Jeter in 1987. I've read quite a few including Gail Carriger's Parasol Protectorate series, which is full of werewolves, vampires and proper Victorian ladies, and is amusing and entertaining. Currently in my backpack are Jay Lake's Mainspring, Lillith Saintcrow's Iron Wrym Affair, Mark Hodder's Strange Affair of Spring Heeled Jack and Cassandra Clare's Clockwork Angel. Find these and more listed on Goodread's humongous list of Best Steampunk Books. Join me in reading Steampunk for the month of June. Nice theme!! I too have got a few Jules Verne books and will be posting my reviews soon. And as I always keep saying, I have been buying and reading a lot but can't sit to post the reviews ! So I am still in week 9! Hoping to catch up on the posting soon. same here...reading, but not reviewing. bad me! Sometimes one post of mini reviews for several books or for the month works for me. May want to try that. 'Fraid I got ahead of the game and read my steampunk book at the end of May--read a collection of Edgar Allan Poe's work called Steampunk Poe. Congratulations on finishing the school year! We still have a ways to go, but considering what all went on, I'm not complaining. High school at home is not too bad. I've gone through it a few times now and we've survived quite well! LOL I post about homeschooling high school and about high school resources every once in a while. Truth Matters, the book that I linked up this week, is a helpful addition to a high school reading list. Wells and Verne are steampunk? Wow, I didn't think I liked steampunk but now I'm going to need to rethink my stance. Thanks so much for your weekly posts. I've hit my 52 books, and then some, but haven't done near enough reviews!